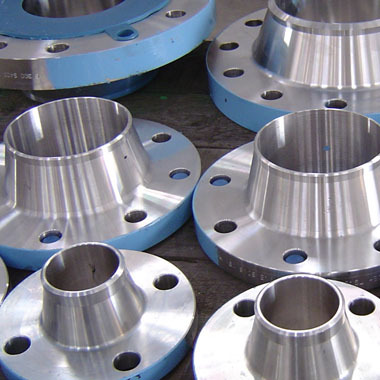 Aspirinox Alloys Inc is one of the most pronounced manufacturers, stockists and suppliers of SMO 254 Flanges due to the great service and products rendered by them. SMO 254 Flanges assures guaranteed resistance to granular corrosion in all the mineral acids. SMO 254 Pipe Flanges serves greatly to be employed in different chemical Industries all over the world and they are extremely useful to fight crevice corrosion and can be used in extreme environments of high pressure and temperatures. SMO 254 Flanges are available in different types like SMO 254 Slip on Flanges, SMO 254 Weld Neck Flanges, SMO 254 Blind Flanges and so on. The SMO 254 Slip on Flanges of Aspirinox Alloys Inc is extremely durable and reliable and these attachments are connected to the pipe were fitted by welding at the top and bottom of the flanges and can be used in different industries. They are typically provided with a raised or flat face. SMO 254 Weld Neck Flanges are available in two different designs, the regular type is used in pipes and the long type is used in process plants. Our SMO 254 Weld Neck Flanges are extremely useful in hostile environments of temperature, pressure, and stress. SMO 254 Blind Flanges are available in relevant Bolt holes in a round plate but has no Centre hole and hence can be used in closing off the ends of the piping systems and openings of the pressure vessels. Plate Flanges are used extensively to simplify connections by offering various methods for expansion joints and pump connections. SMO 254 Threaded Flanges are another type of flange which is characterized by tapered threads and can be employed in high-pressure systems because of their small diameter and is extensively used in many industries. The exclusive flanges catalog is available on our official website. You can take a tour and can get your deemed services. Request a free quote now! Specifications for SMO 254 / UNS S31254 Flanges. If any specification is not mentioned here, please use the contact button for quick quote. Request the latest SMO 254 / UNS S31254 Flanges List. Please click on the request a quote button or click here to request the updated price list and ready stock information along with your requirement. Aspirinox Alloys INC maintains stock of all standard items and can export them at best price for SMO 254 / UNS S31254 Flanges .